28 January 2019, at 2:37p.m. What will 2019 hold for the global pig industry? Here are the quick facts you need to know about the major developments in the industry worldwide, and where it might be headed in the next 12 months. The pigs culled so far amounts to less than 0.1 percent of the live pigs in China . China continues to be the biggest importer, producer and consumer of pork products globally . While new outbreaks of ASF continue to be reported, movement of pigs and pork products through the country has been restricted. The movement of feed and feed content is also being closely monitored. With movement restricted, prices of pork and pork products in urban areas in China have increased while more rural areas and places with high pig populations are seeing a decrease in prices . Increased monitoring on pork products will remain in place . African swine fever has been confirmed in Europe, Africa and China . The disease has no vaccination, no treatment and can have a 100 percent mortality rate . Suppliers of feed have been asked to store the feed products from these countries for several months which should result in at least 99 percent of the virus dying off . Costs of feed may increase as suppliers buy buildings to contain and store their quarantined supply . Pork products from the US to China have been made subject to tariffs of up to 70 percent, opening the Chinese market to imports from other countries . Imports of pork products from the European Union and Brazil to China are expected to increase by 3 percent . Pork production in the US is expected to increase by almost 6 percent in 2019 . The tariffs on US products to China imposed in 2018 are expected to decrease by the end of 2019 . US pork producers will look towards other countries to buy their pork. Exports would have to increase by 23 percent to export all additional pork products . The 11 countries involved in the revived Trans-Pacific Partnership trade agreement, which came into force in December 2018, are expected to see an increase in all exports of about 2.5 percent . The 11 countries represent about 13 percent of the global economy . Canada will gain access to a much wider Asian market for its goods. Before TPP, Canada only had an agreement with South Korea . Canada continues to be one of the top five pork-producing countries. Total imports of pork and poultry to TPP countries will increase by 0.14 percent, while exports to non-TPP countries will decrease by 0.13 percent . Several other countries are in talks about possibly joining the agreement. South Korea could be the next country to join . Japan imports about 1.25 million metric tonnes of pork product each year, and is consistently one of the top two largest importers of pork products globally . Imports from Canada, the EU and Mexico into Japan are expected to increase by about 5,000 tonnes as tariffs on pork drop as trade agreements take effect . Imports of US pork products to Japan are expected to stall as the tariffs remain at the standard level, which will be about 3 percent higher than the tariffs from the other major pork export markets: the EU, Canada and Mexico . © Food and Agriculture Organization of the United Nations, November 2018 Food Outlook biannual report of global food markets. About 80 percent of Brazil’s soybean harvest goes to China. .
China bought 50.9 million tonnes of soybeans from Brazil between January and August 2018 – 6.8 million tonnes more than it purchased during the same period in the previous year. This increase is seen as a result of trade tensions with the US . Experts expect China to continue to favour Brazil soybeans in 2019 . Brazil’s overall soybean exports are up 20 percent year-on-year, hitting a record of 64.6 million tonnes . With a record crop of soybeans expected from Brazil at the beginning of 2019, prices may fall globally on all soy feed . Almost all of the reserved soybeans in the Brazil market have been sold to China . Prices for US soybeans are expected to stay low during 2019. The US season-average farm price for soybeans is projected unchanged at $8.60 per bushel . China’s purchases of soybeans from the US dropped in 2018 compared to 2017, from 21.4 million tonnes in the first 10 months of the year to 8.2 million tons in the first 10 months of 2018 . Global demand for soybeans outside of China is being met with extra US supplies, but the market has dried up as farmers have taken advantage of the low cost of US soy. Soybeans have been stored for future use . US farmers are expected to plant about 7 percent less soy in 2019 . As Brazil starts to harvest the new soybean crop at the beginning of 2019, US sales to China will decrease. Desperate to sell, US soy suppliers could reduce their prices to reach the lowest in a decade . The UK imported about 700,000 tonnes of pork products from the EU in 2018 . Predictions for pork markets post-Brexit are vague and unpredictable but an initial review suggests that Brexit will have little impact on global or domestic pork sales in Britain . 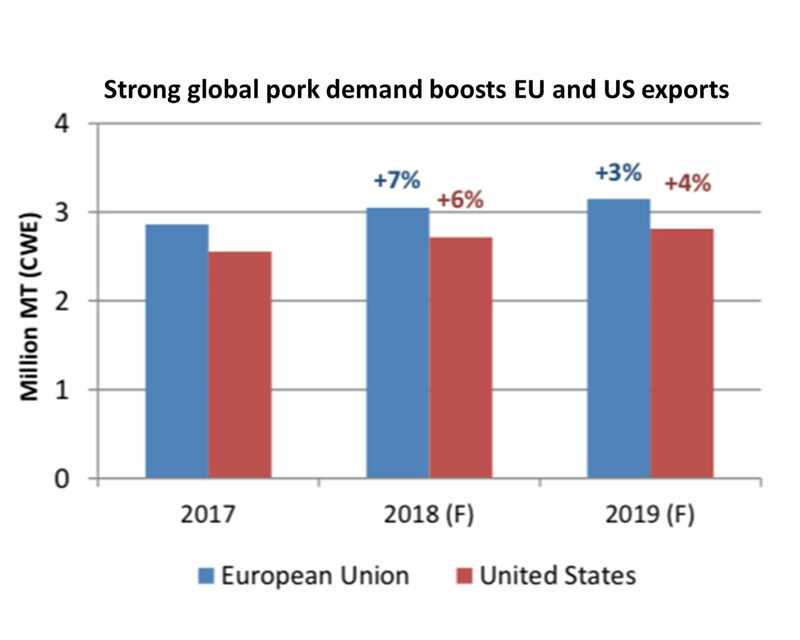 If trade with the EU remains open, little change is expected in the EU pork market. Global demand is expected to go up by 6 percent in 2019 . Mexico’s per capita pork consumption has grown by nearly one-third over the last 10 years and now sits at just over 39lb. Consumption in 2019 is expected to continue to grow . Mexico’s imports are expected to increase by 5 percent . Columbia is expected to import 29 percent more pork in 2019 . Japanese imports of pork should increase about 2 percent . South Korea’s imports of pork are expected to decline slightly after a near-record year of imports in 2018 . 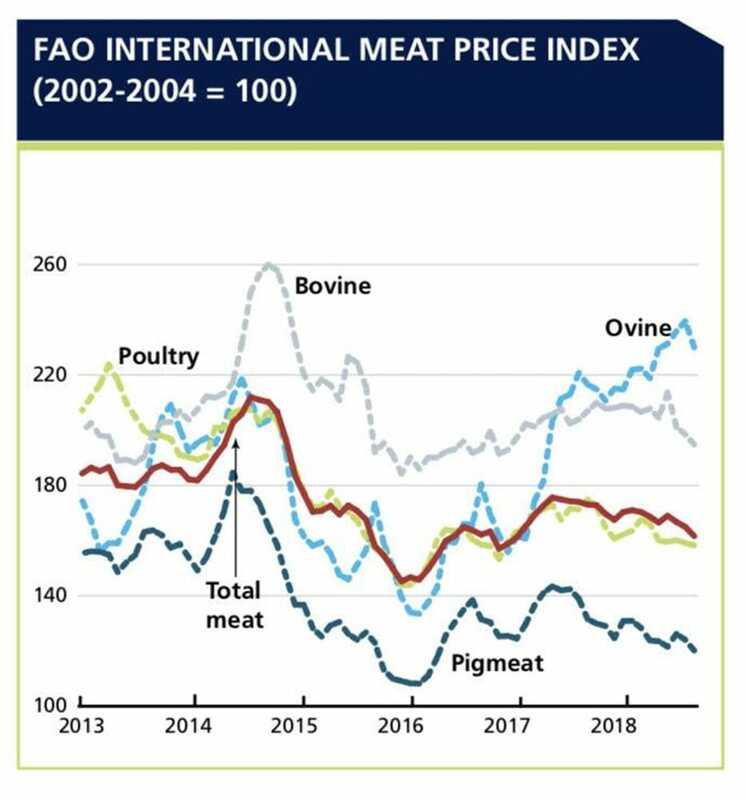 Pigmeat is still anticipated to make the largest contribution to the expansion in world meat output this year, followed by poultry, bovine and ovine meat . 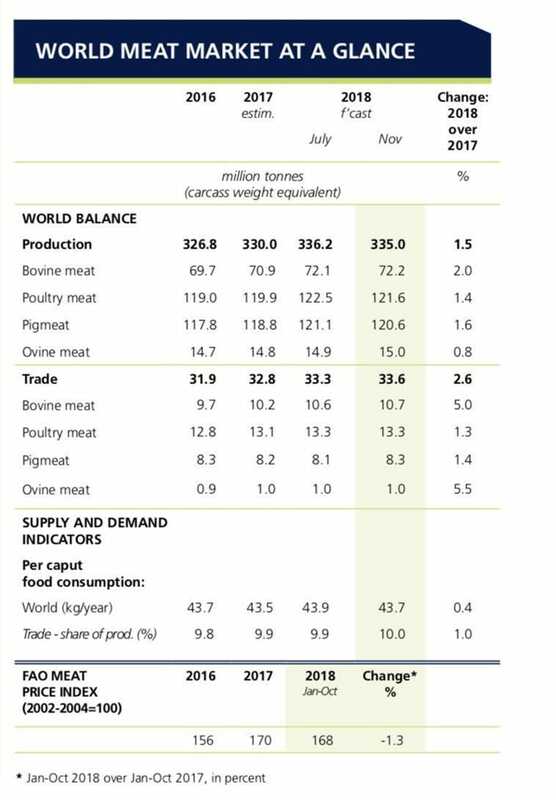 Production in the EU is expected to decrease slightly as domestic demand for pigmeat stabilises and global competition increases . IQC Insights – African swine fever in China: 87 cases and counting. USDA Hogs and Pork update. Steve Meyer, Economist at Kerns and Associates. December 4, 2018. Dr Dermot Hayes, Iowa State University. Department of Economics. Agriculture Information Management System (Ag-IMS). USDA Pork and Hogs, World Markets and Trade. Canada West Foundation. The Art of the Trade Deal: Quantifying the benefits of a TPP without the United States. Carlos Dade, Trade Director, Canada West Foundation. USDA, Japan-EU Trade Agreement threatens US pork exports to Japan. Reuters, Brazil exports 80 percent of soy to China in January-August: agriculture ministry. USDA world agricultural supply and demand estimates. AgUpdate, Brazil’s soy crushers run out of beans. AHDB, UK pig meat imports. Pork Business. Will the pork industry have a better 2019? Pork Checkoff. Mexico: US pork’s leading volume market. Pork Checkoff. US pork exports: September trade update.